May 28, 2015 / admin / Comments Off on Up to 70% OFF!!!! Crazy deals: Up to 70% OFF right now at Emergency Essentials ! These deals only last till 5/31!!! Emergency Kits up to 43% OFF!!! Kits prepare you for most emergencies! Don’t be without an emergency kit! Ideal places to keep your emergency kit: Your home, your work, car, and children’s school. These buckets are easy to stack and store AND they’re packed with 126 single-serving pouches each – enough to feed one person with breakfasts, lunch or dinner for an entire month!!! Wow! This is a great book: Just Dutch It! 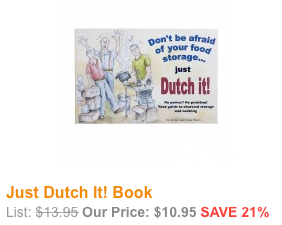 Book – Learn how to use your food storage – dutch oven style! YUM!!! Recipes that can include several food items or just a few! Tips for successful dutch oven cooking are included! Combo Sale! Fruit, Vegetable, Entrees, Side Dishes, Freeze-Dried, Samplers. These COMBO ESSENTIALS are amazing ways to build your food storage! MREs are a fantastic way to add long-term and ready-to-eat meals to your 72-hour kits! 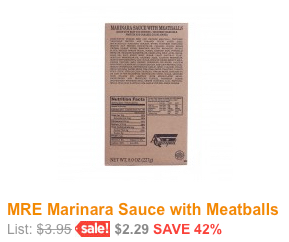 The MRE Marinara Sauce with Meatballs is an excellent choice to add to your meals! 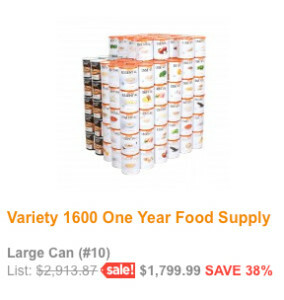 This One Year Food Supply includes a great variety of food! Over $1000 off is a pretty hefty steal of a deal! All in those beautiful #10 cans!